I know we’re barely half-way through Spring, but with my closet quickly filling up with breezy dresses and my snowboard delegated to dust collecting duty, it’s safe to say that Summer can’t come quickly enough. Most mountains around BC are keeping their fingers crossed that this season’s snow will melt in time for the sunny months, though no mountain more than Mount Washington Alpine Resort. With a base of more than 600cm (yes, even to this minute), mountain bikers could be in for a surprise come June. Take in a view to a thrill and bring the whole family – dads ride the mile-high lift to the top for free! Friday, July 9th from 6:00 p.m. – 9:00 p.m.
Beer enthusiasts will assemble at the Raven Lodge for unlimited samplings, a souvenir beer glass and some good old fashioned rock and roll. Tickets sell for $30 each; must be 19+ years to attend. Saturday, July 17th from 2:00 p.m. – 1:00 a.m.
Cumberland Village Works presents a tasty preview to The Big Time Out, high above the Comox Valley. This day-long music festival features The Cat Empire, Daniel Wesley and much more exciting entertainment to be announced soon. This two-day inaugural event has been designed to bring chicas of all skill levels to this alpine paradise for a weekend of riding, coaching, eating, drinking and relaxing. Friday, August 6th from 6:00 p.m. – 9:00 p.m.
There’s nothing I look forward to more each Summer at the mountain than the Alpine Wine Festival. High class meets high altitude as wine connoisseurs and grasshoppers alike meet at the Raven Lodge, set against breathtaking mountains, to sample of the best wines that BC and the world have to offer. Tickets sell for $30 each; must be 19+ years to attend. With Summer sunshine comes the much-dreaded HST. Stick it to the man and buy your 2010/2011 alpine or nordic season pass by the end of April and skip the extra tax. 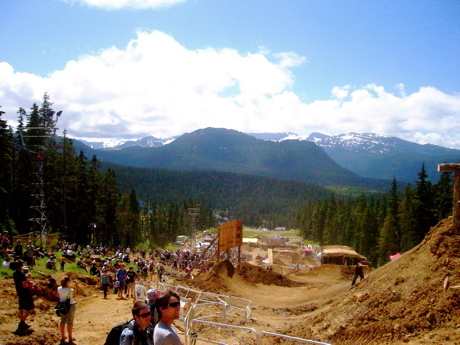 Early bird mountain bike passes are currently on sale for $250. Visit Mount Washington Alpine Resort’s official website for more information on these and other great events and offers. I’m giving away an armful of AXE gear and a Flip MinoHD video camera (worth $249.99!) to one lucky reader. Click here to enter if you haven’t already. Contest ends Friday, April 30, 2010. Gotta head over to Mt.Washington one day!